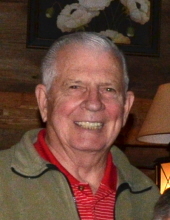 Robert G. Little, age 84 of West Grove, PA passed away peacefully on April 14th surrounded by his loving family. A West Grove resident for 20 years, Robert was a Springfield resident for 48 years and a well-respected business man who owned and operated Little Brother Butcher Shop located on Saxer Ave., in Springfield. He graduated from West Catholic High School, Philadelphia in 1952, served his country with the USMC in the Korean Theater of War from 1954 to 1956. Upon his honorable discharge, he married Helen J. Pancoast of Springfield. Robert loved golf and is former scratch handicap. For many years he held the course record of 62 at the Springfield Country Club and was a former member of the golf team at Rolling Green Golf Club where he was a member for many years. In retirement, he loved traveling the country in his RV with Helen. Robert is proceeded in death by his wife of 55 years, Helen Pancoast and both brothers, Leonard and Daniel. He survived by his oldest daughter, Louise (Raymond) Mackey of West Grove, Robert G. Little, Jr. (Robin)of Concord Twp., Joseph M. Little (Jacque) of Springfield, John F. Little (Catherine) of Nazareth, William M. Little (Barbara) of Coatesville and Patricia (Thomas) Flaherty of Springfield. Known as Bobby, he had 21 grandchildren; Robert, Elizabeth, Amanda, Patricia, Jeffrey, Bradley, R. George III, Meron, Olivia, Joseph, Katelyn, Annalyse, Brittany, Lindsay, William, Thomas, Patrick, Mark, William, Shannon, and Mary. He also had 14 great grandchildren. Robert lived a good life and was surrounded by family throughout. He was well respected and loved by many. He was an honorable man who loved God, Country and family. A private Mass will be held at St. Kevin’s in Springfield followed by internment at Holy Cross Cemetery in Yeadon. To send flowers or a remembrance gift to the family of Robert G. Little, please visit our Tribute Store. "Email Address" would like to share the life celebration of Robert G. Little. Click on the "link" to go to share a favorite memory or leave a condolence message for the family.